Moore's Law (or the exponential growth of integrated circuits) is actually referring to the fifth paradigm of computation. Here's the list of the underlying technologies: (1) Electromechanical; (2) Vacuum Tube; (3) Relay; (4) Transistors; and (5) Integrated Circuits. Quantum computers may well be the sixth paradigm, given that they work in a fashion that is entirely different from "classical" computers. A classical computer performs operations using classical "bits" – these "bits" can be in only one of two states: "0" OR "1." In contrast, a quantum computer uses 'quantum bits,' or 'qubits'. Thanks to a principle called quantum superposition, these qubits can have a value of "0", "1," or both "0 AND 1" at the same time. This capability allows quantum computers to solve certain types of complex problems that are intractable for conventional computers. Frankly, really exciting problems for society today, as you'll see below. By the time you get to 300 qubits, you've got a computer that can do more "calculations" than there are atoms in the universe. That's why the blog TechTarget described Quantum computing this way: "Development of a quantum computer, if practical, would mark a leap forward in computing capability far greater than that from the abacus to a modern day supercomputer, with performance gains in the billion-fold realm and beyond." The implications of true quantum computing at scale are staggering, of extraordinary impact to society today (which is why I'm tracking it). Bottom Line: When quantum computing pans out, we'll be able to control the very building blocks of the universe. Who's Working on Quantum Computing? There's a race going on – a race to prove something called "quantum supremacy." Both Rigetti Computing and Google believe they will reach "quantum supremacy" in the next 12 to 18 months. To put this into perspective, I had a chance to catch up with Chad Rigetti, the CEO of Rigetti Computing (he'll be one of our amazing mastermind participants at the 2017 Abundance 360 Summit this January). Below is a picture of the most powerful 'classical' computer on the planet, Tianhe-2 in Guangzhou, China. And it's about half the size of a football field, with 3.2 million Intel cores. 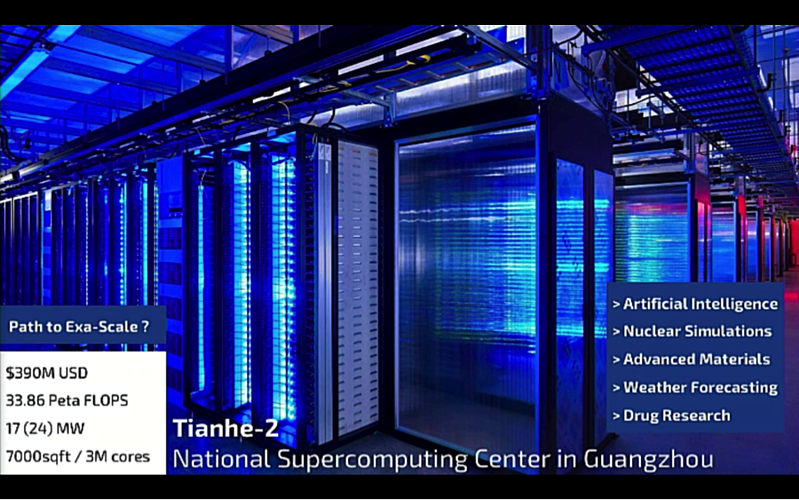 President Obama, in the attempt to drive America's return to high-performance computing supremacy, declared that the U.S. would build an exoscale computer, 30x more powerful than Tianhe-2, by 2020. "We need to do this," explains Chad Rigetti. "But there is another path. Quantum computing." Below is a picture of two developmental systems in Rigetti's lab in Berkeley, CA.